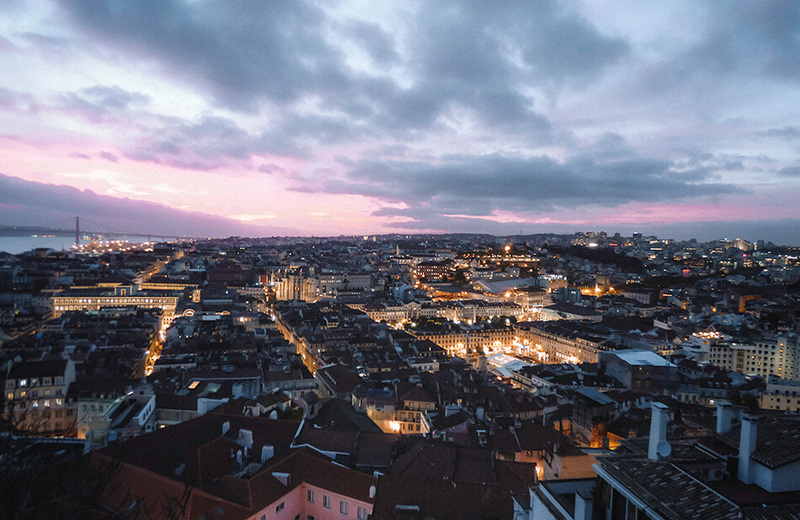 Oh, Lisbon… You have stolen our hearts! 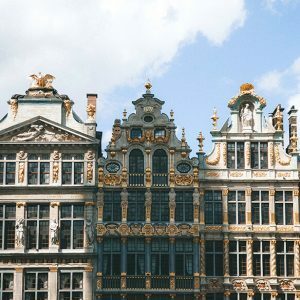 A city so full of charm, cobbled streets and warm and friendly people. What is not to love about its sea views, steep hills peppered with historical landmarks and an excellent food culture? We must admit, however, we didn’t really know anything about Lisbon before we got there. It doesn’t have any renowned landmarks like other cities have. Nothing that compares to the grandeur of the Big Ben, the Eifel Tower, the Statue of Christ Redeemer or the Statue of Liberty at least. 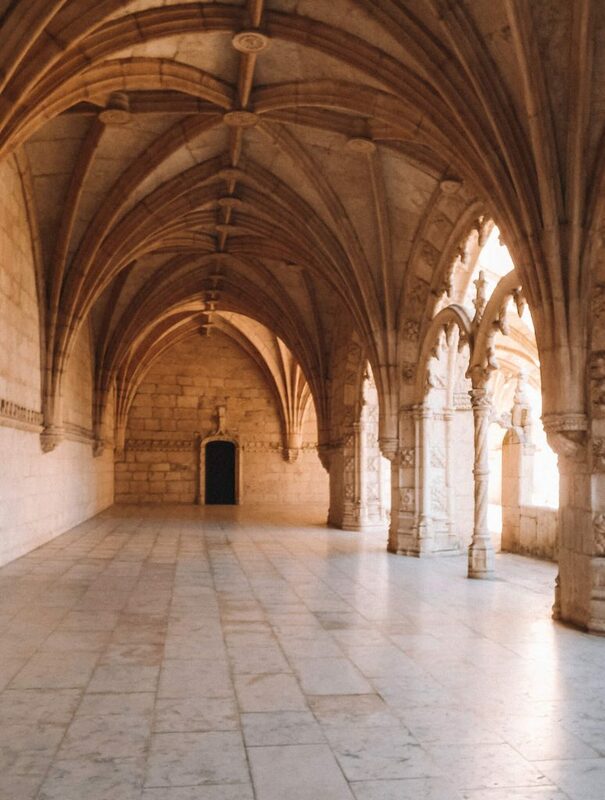 Lisbon’s top things to do do make for an unforgettable trip, though, and has surprised us in every possible way. 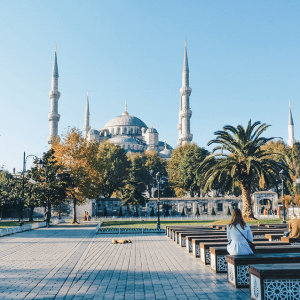 When scratching the surface it is possible to spend weeks in this beautiful underrated capital and still discover something new and interesting every day. If you only have a weekend, however, you can still get a good impression of the city and its highlights. We were here last in 2015 when we were able to flee Belgium’s grim autumn weather during a short city trip. 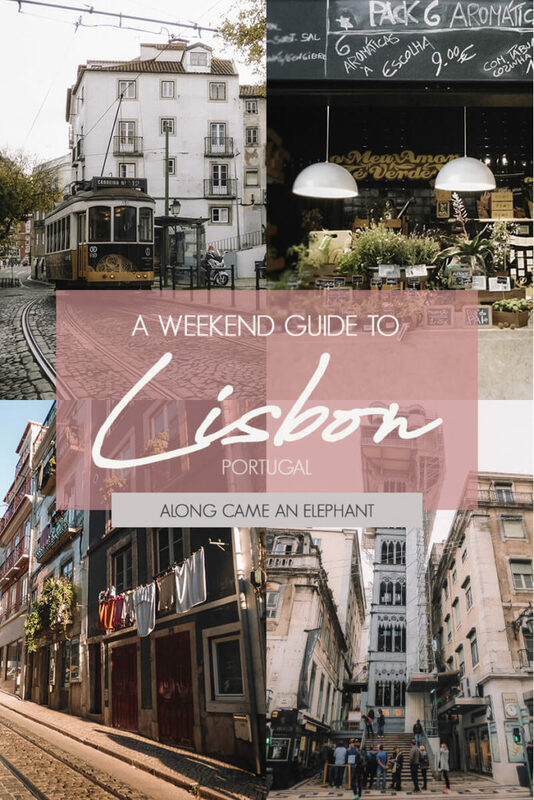 Here’s our favourite way to explore Lisbon in 48 hours. 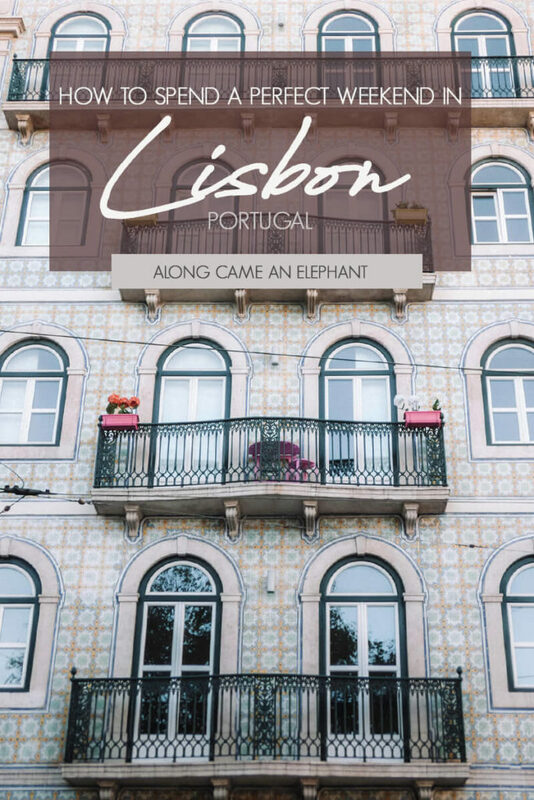 The most important part to see Lisbon in 48 hours will be choosing where to stay. 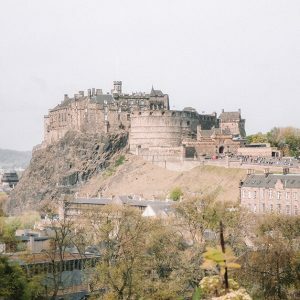 Airbnb is our favourite way to enjoy this special city and here are some of the apartments we looked into: the one with the best view in town, the classy one, the one with the best location and the one with a pool. If you’re new to Airbnb, get a discount for your first booking here. 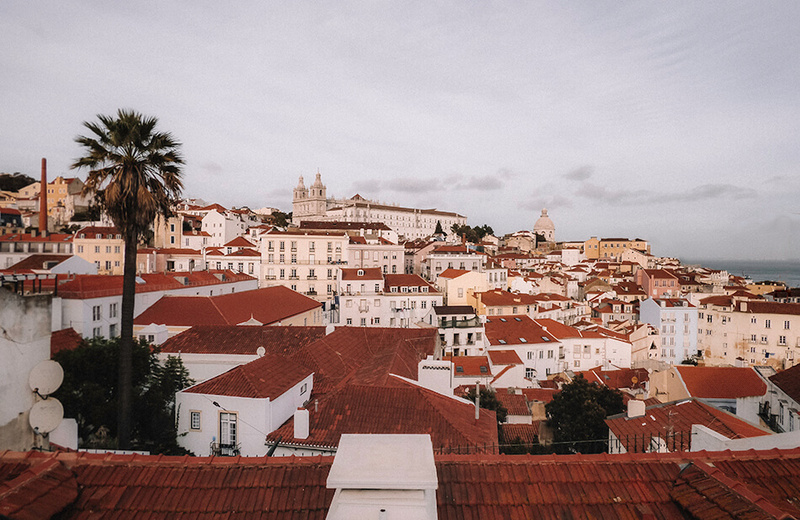 If you’re looking for a romantic experience, choose a suite at Boutique hotel Santiago de Alfama, a sunny room at Solar do Castelo or a room with city views at the Lx Boutique Hotel instead. 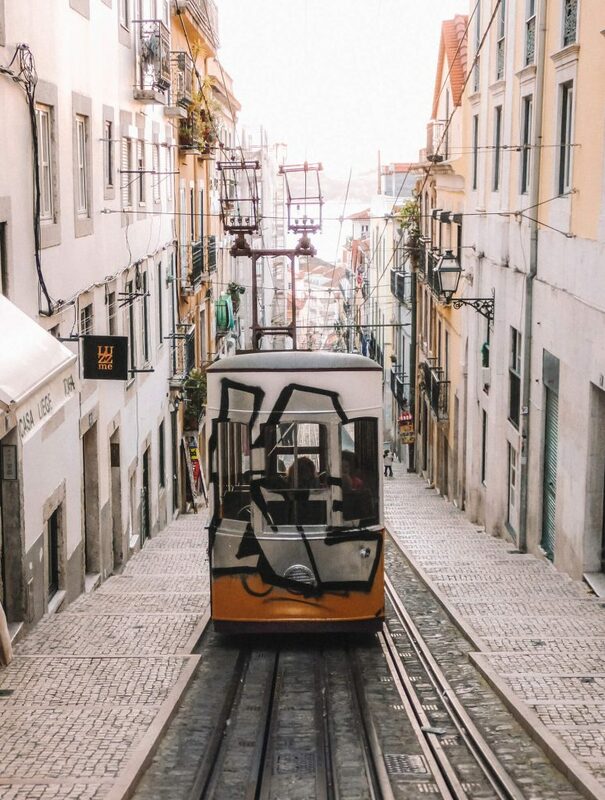 One of the most memorable things to do in Lisbon is riding in the bright yellow 28 tram. 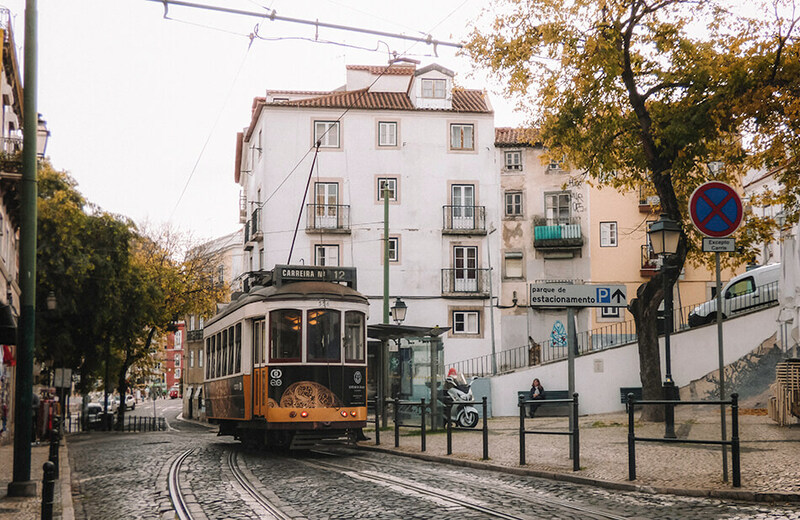 Like San Francisco, Lisbon is a city known for its historic tram lines. These antiques have been carrying people up and down Lisbon’s hills since the 1930s. Our stop today is Alfama, one of the most traditional neighborhoods of Lisbon. 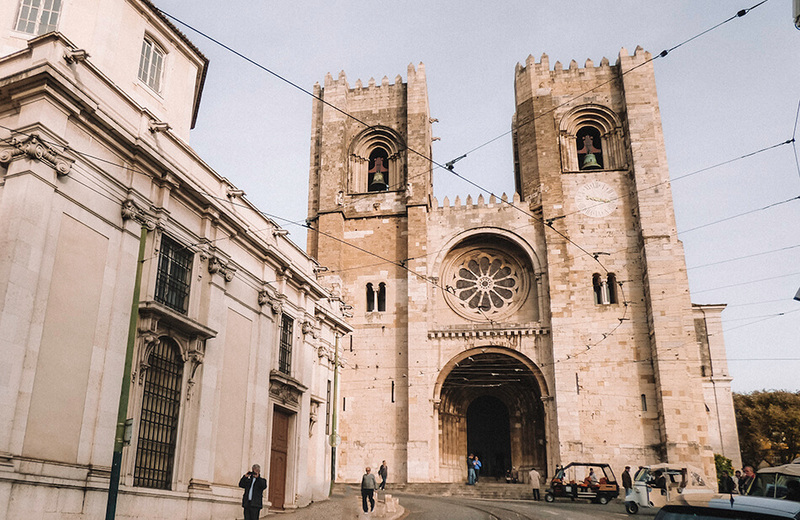 En route, take a pit stop to see Sé Cathedral, Lisbon’s oldest church and enjoy a coffee in Portas do Sol, one of our favourite viewpoints in Lisbon. From here you’ll get a great panorama the slopes where Alfama rests. Get comfortably lost in the narrow eclictic streets and get time warped to the 18th century. Feast your eyes on the beautifully decorated ancient stately buildings with traditional azulejos. We never get far without stopping a million times to snap those stunning azulejo tiles that come in the most amazing colours. 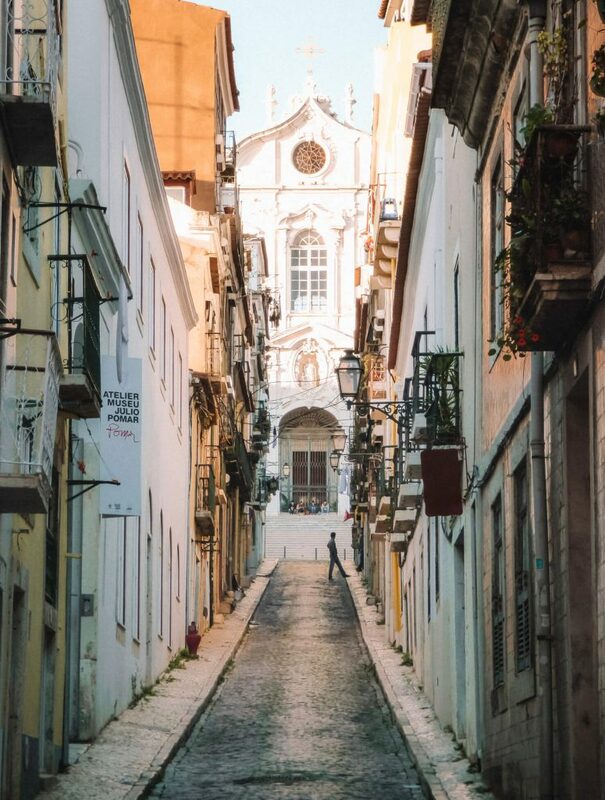 The hilly streets are lined with restaurants but our absolute favourite has to be Restaurante Santo Antonio de Alfama. 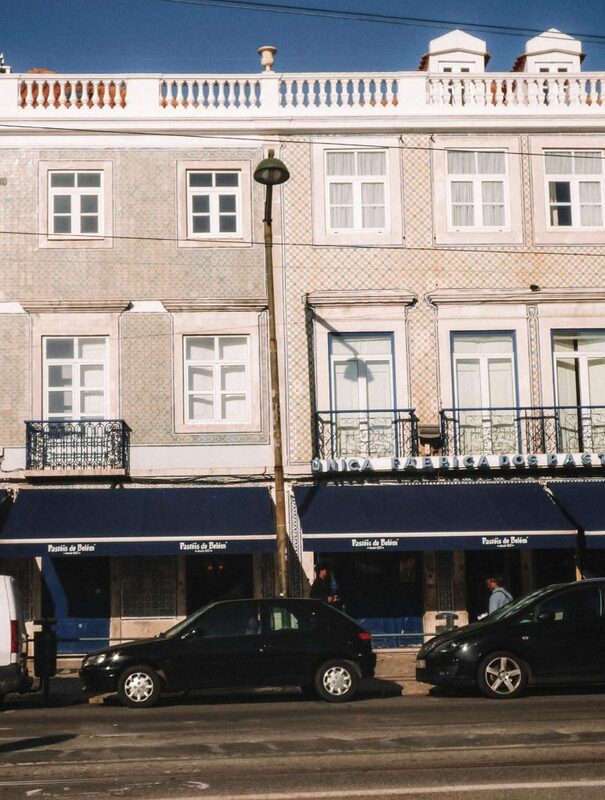 Arguably the best restaurant in Alfama to indulge in typical Portuguese food. Alfama has some wonderful souvenir shops. 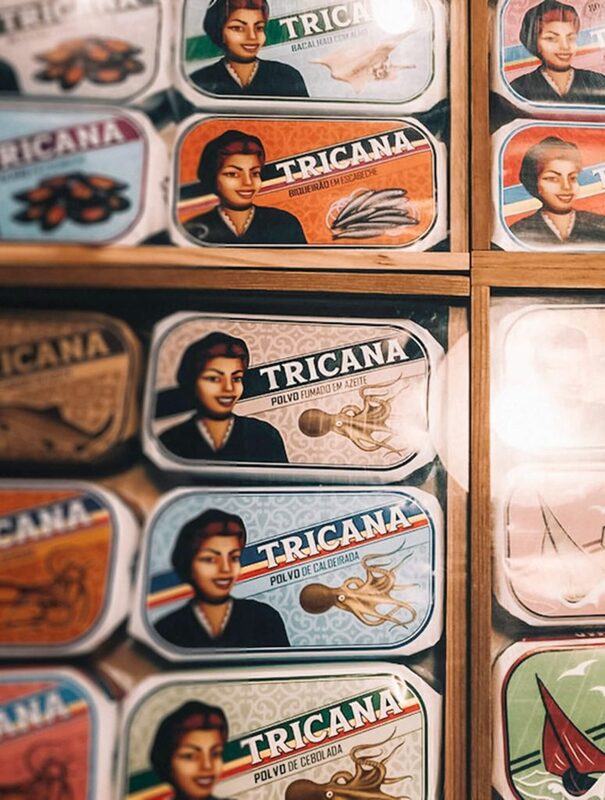 If you’re looking for something quintessentially Portuguese, purchase products made of cork, clay dishes or a tin of sardines. 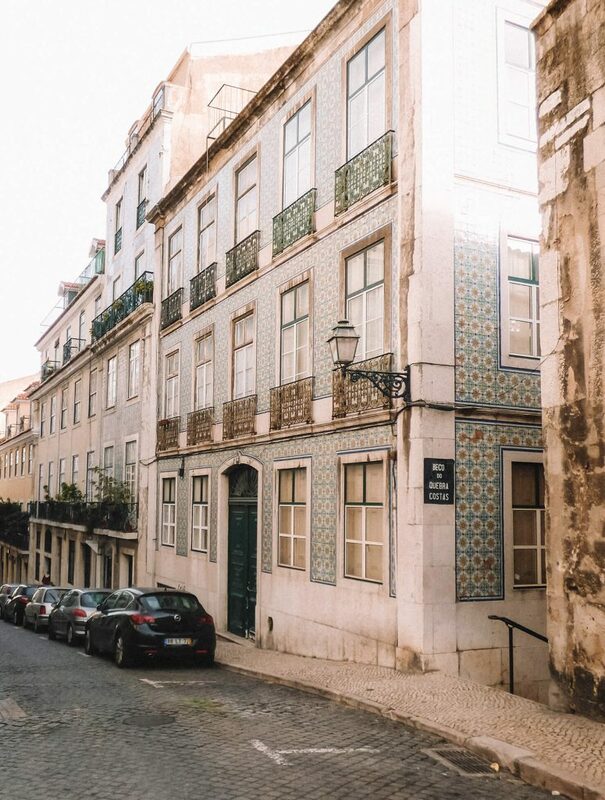 Head to Baixa, the ‘lower neighborhood’, and visit the Conserveira De Lisboa, a charming Portuguese cannery that takes you back to the 1930s. Complete with its original cash register, shelving and countertops, the shops one sells one thing: vintage canned sardines! A large part of Baixa was destroyed by Lisbon’s disastrous Earthquake of 1755. 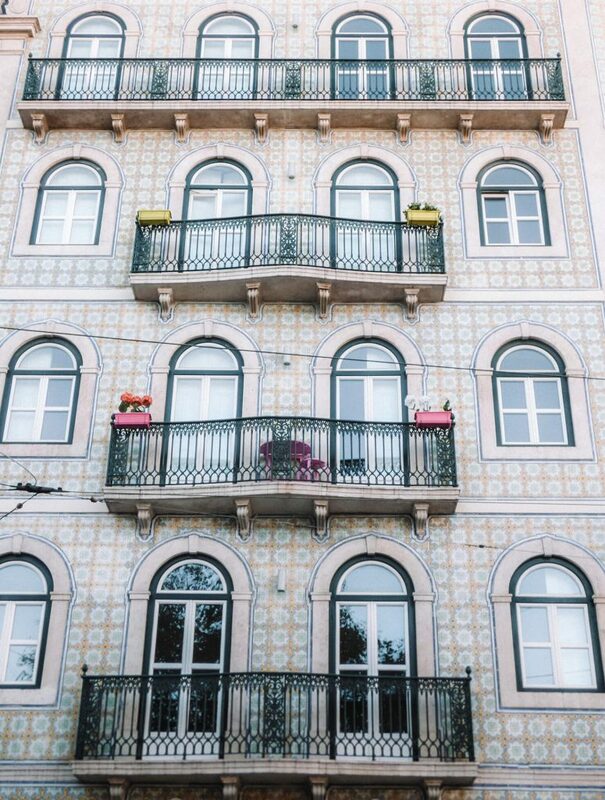 Now, it has become one of the trendiest neighborhoods of Lisbon after decades of rebuilding. The romantic bistros, eateries, shops and typical Portuguese architecture are the main draws for visitors. 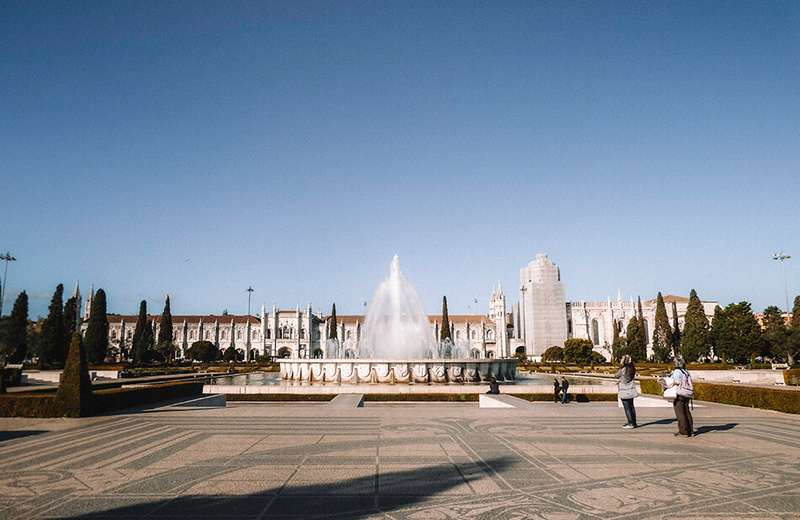 The beautiful Praça do Comércio leads to a set of stone stairs ending in the Tagus River. It’s a wonderful spot for views of the Santuário Nacional de Cristo Rei and the 25 de Abril Bridge (looks like the Golden Gate Bridge in San Francisco). 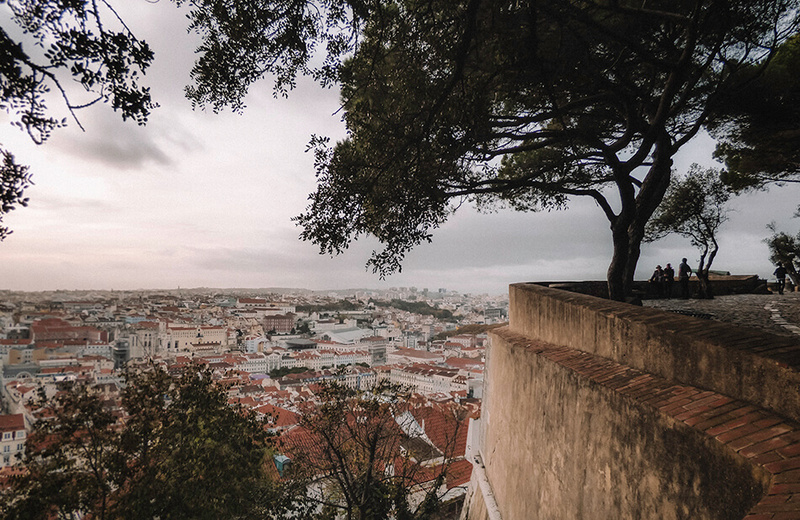 Make your way back to Alfama and up to the Castelo de São Jorge. The castle is beautifully restored, after being severey damaged by the 1755 Lisbon earthquake, offering glimpses about how 12th century court life would go about. 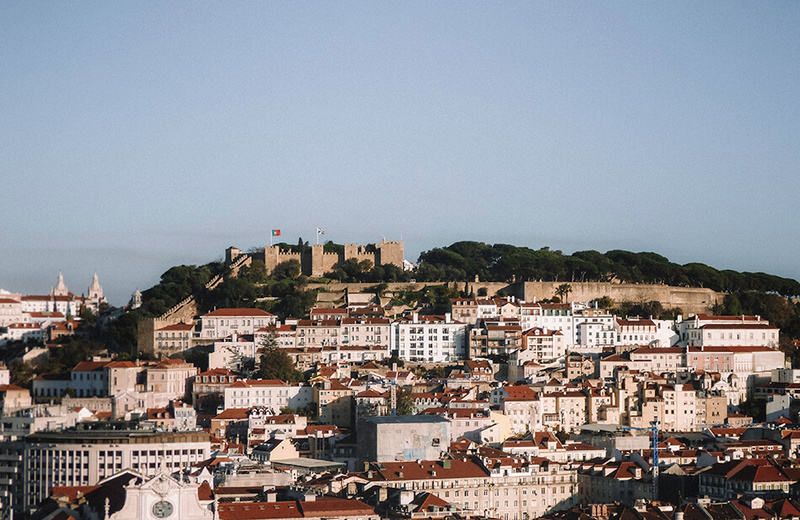 The 12th century castle is built on one of Lisbon’s seven hills making it almost impossible to beat the panorama of red-tiled rooftops. 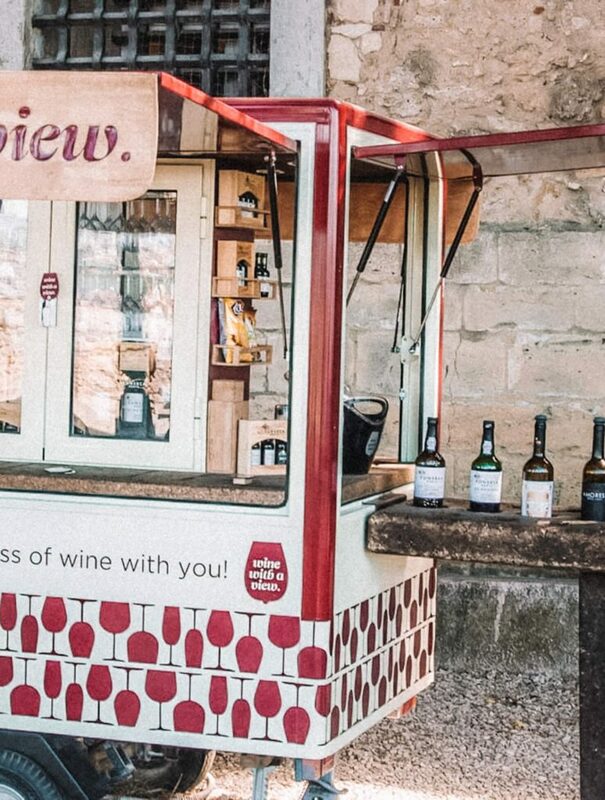 Get a glass of wine from the ‘Wine with a view’ bar and enjoy the sunset al fresco on the large patio overlooking the Tague River. First things first. Start the day with an infamous and really delicious ‘pasteis de nata’ and a bica (espresso) in Bélem. 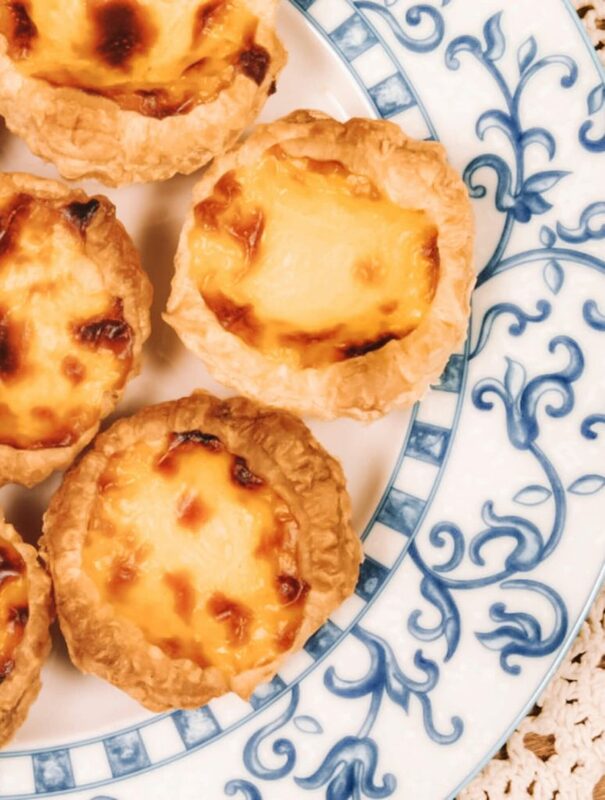 These wonderfully crisp egg tarts with cinemon are made following an ancient recipe from the Mosteiro dos Jerónimos at Pasteis de Bélem, our favourite bistro to enjoy these deliscous creamy beauties. The rickety yellow tram will drop you off right in front of the shop. It is a popular place and can get quite busy. If you don’t have the time to sit down and enjoy your pastry, buy some as a souvenir at the take-away counter. 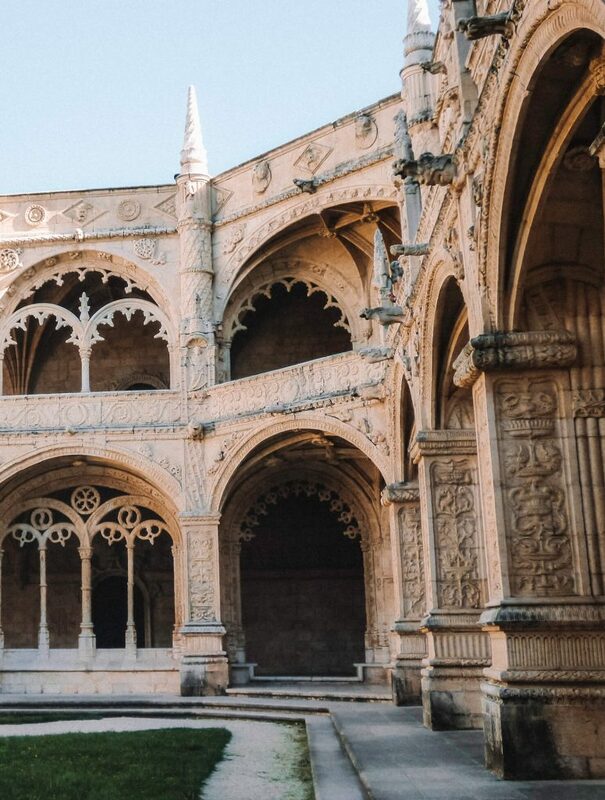 The richly ornate style decorations of the Monastery of Sao Jeronimo should be enough to distract you from your yummy egg tarts for some further exploring. The raison d’être for this amazing monument is to celebrate Portugal’s most glorious explorations during the ‘Age of Discoveries’. Not surprising the monastery and church were built on the exact location where Vasco da Gama and his men spent the night in prayer before departing on their expedition to the Orient in 1497. The entire assembly of opulent spires and sumptuous carvings is a classified UNESCO World Heritage Site, along with the nearby Tower of Belém. 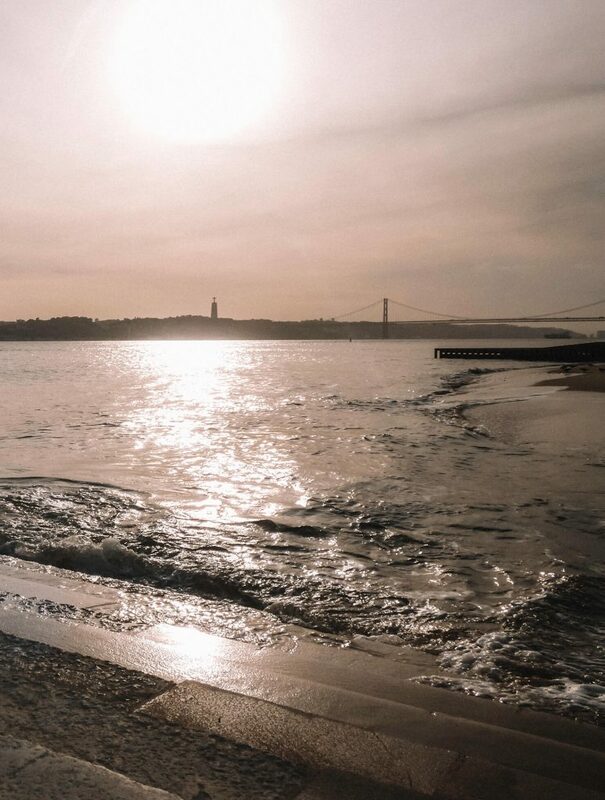 When leaving the monastery, head straight forward to the river Tagus where the Padrão dos Descobrimentos (Monument of the Discoveries) greets you. The beige historical monument is another lavish testimony to the successes of Portuguese exploration. 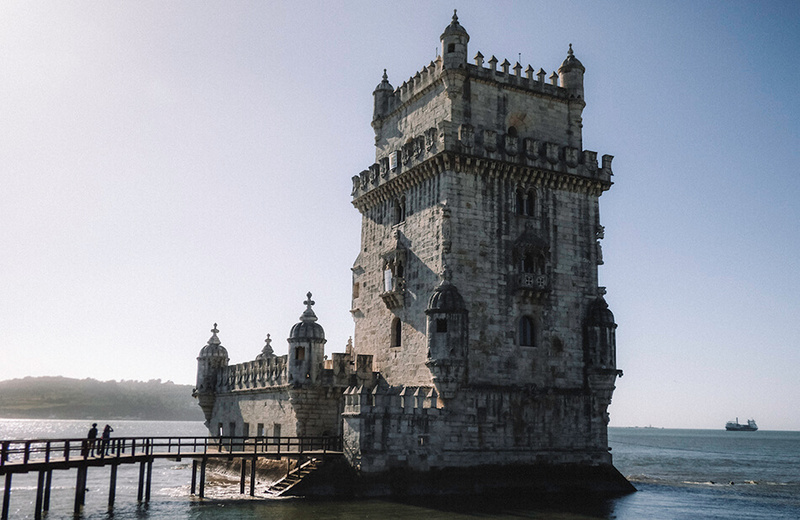 Enjoy the sunshine and stroll along the waterside of Santa Maria de Belém to the Torre de Bélem. 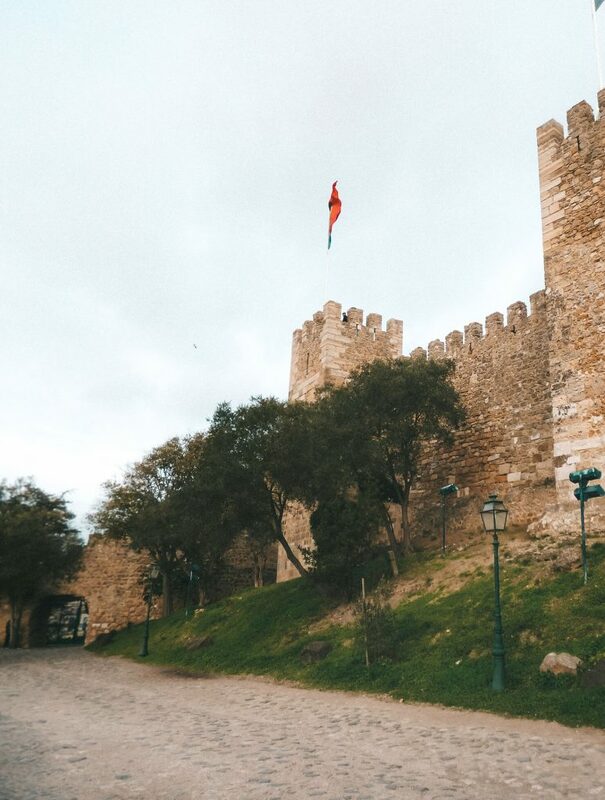 This second UNESCO world heritage site used to be part of the Lisbon defence system, marking the mouth of the river Tagus. Now, most it’s probably Lisbon’s most iconic feature. 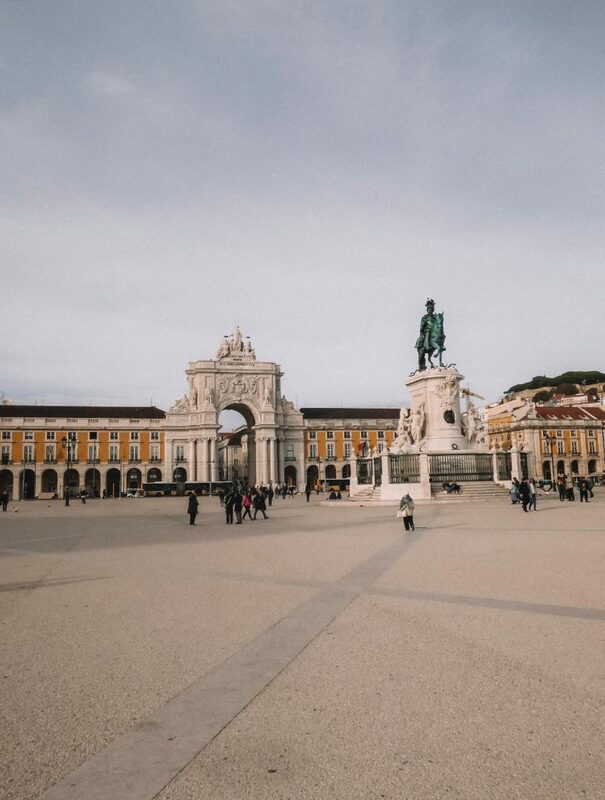 The ceremonial gateway to Lisbon is perhaps the very last glimps Vasco da Gama would have seen of this beloved city as he drifted out to the far Orient. Foodtrucks often line the waterfront between the two monuments. Grumbling stomachs can find relief with awesome fresh smoothies and fancy hot dogs. 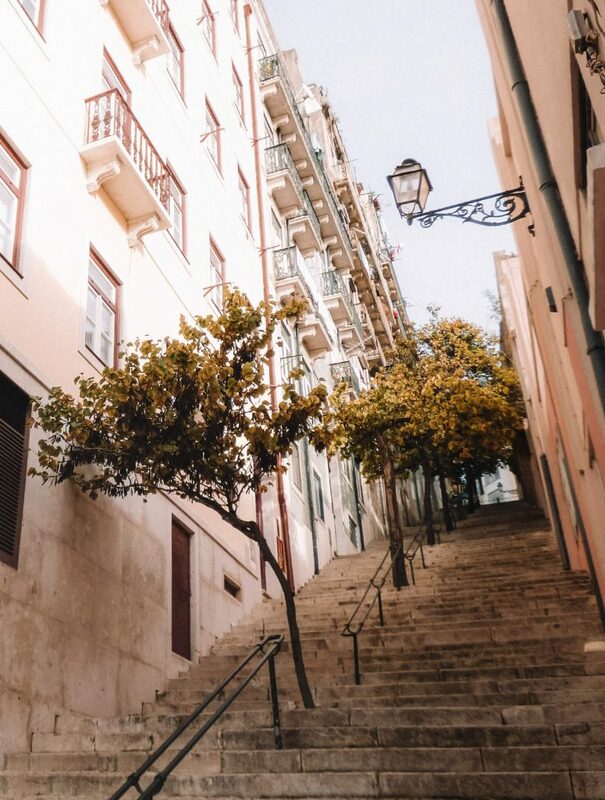 Ride the ancient Santa Justa Elevator to Carmo and take in the sweeping views of downtown Lisbon. Stroll from one neighborhood to the next and take in the gypsy vibe, cozy alleyways and trendy shops. 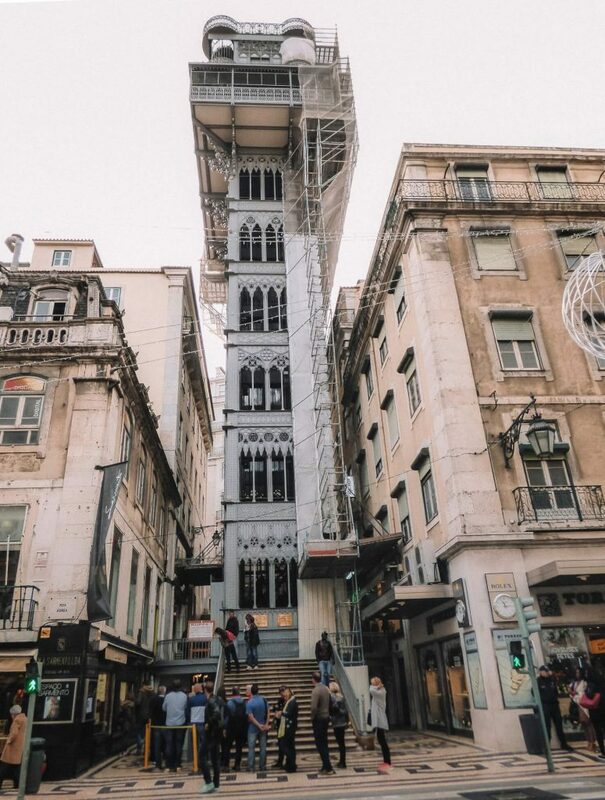 Ride the ancient Santa Justa Elevator to Carmo and take in the sweeping views of downtown Lisbon. Stroll from one neighborhood to the next and take in the gypsy vibe, cozy alleyways, trendy shops and jaw-dropping miradouros (viewpoints). 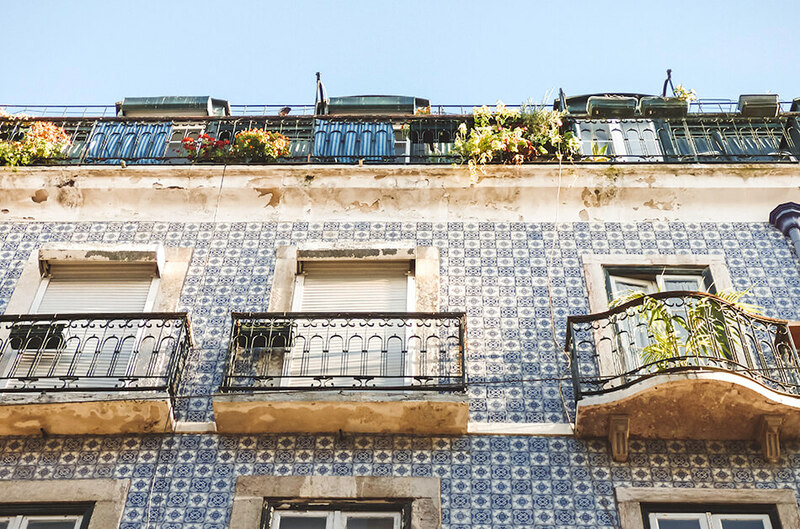 Chiado and Bairro Alto are the most stylish and bohemian neighborhoods in Lisbon, hence our favourites! 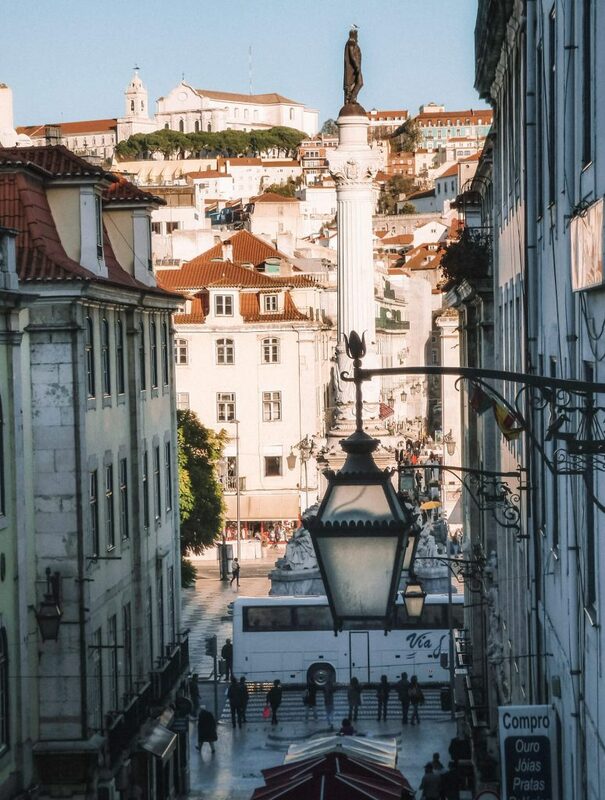 Bairro Alto is packed with new breweries, open-air cafes with Fado music luring locals and tourists alike and offers a plethora of good restaurants. Enjoy some trendy cocktails and live music before heading to the infamous Mercado da Ribeira for the most amazing display of food! Lisbon has been catapulted to the top of our favorite cities so far and I hope I’ve convinced you of all its splendour as well! 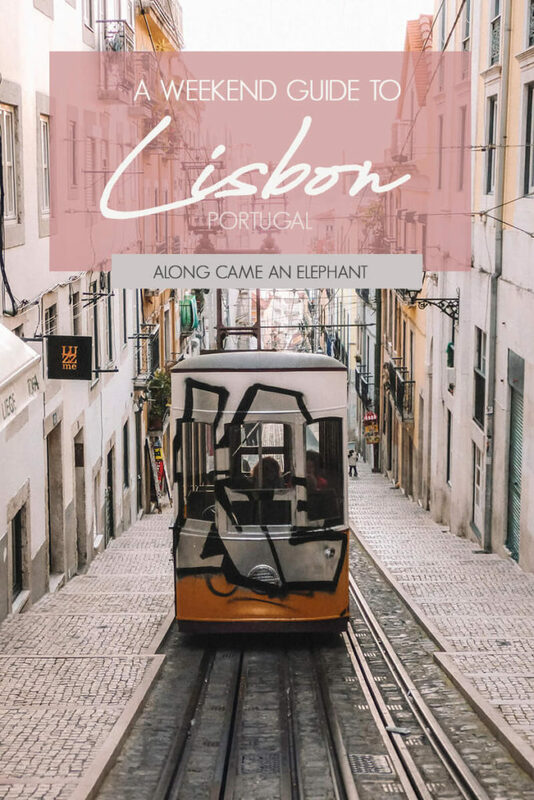 Have you been to Lisbon? What did you LOVE about it? Celebrate carnival off the beaten track in Maastricht, The Netherlands!